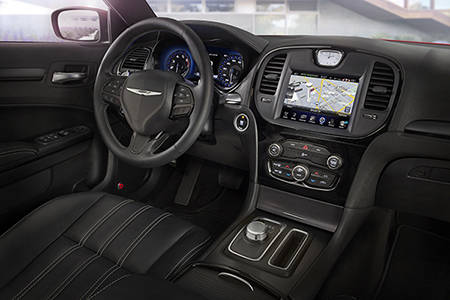 The 2016 Chrysler 300 has seen many changes since its beginnings in the Fifties. Now in its tenth generation, the Chrysler 300 has evolved into an excellent spacious sedan for professionals and families. Since changes were made to the overall Chrysler 300 in 2005, the Chrysler 300 features rear-wheel drive and Chrysler’s award-winning, racetrack-proven HEMI V8. The current Chrysler 300 model lineup consists of four different trims with the Chrysler 300 Limited as the most basic trim. The Chrysler 300 Limited is powered by a 3.6-liter V6 engine that turns out 292-horsepower. It’s connected to the rear wheels through an 8-speed automatic transmission with rotary e-shift. The 300 has an average EPA fuel economy of 19 MPG when in the city and 31 MPG when driving on the highway. Its standard rear wheel drive offers performance that is not found in many of today’s sports cars as they are generally equipped with front-wheel drive. Buyers also have the option of all-wheel drive on the 300 Limited. In its most basic form, the 300 has a classy exterior. It has a smooth and sleek body and a large black front grille which has Chrysler’s recently updated logo. It sits on 17-inch platinum painted rims and Michelin tires. There are dual-rear exhaust tips and heated exterior windows. Buyers have the option to choose from nine different colors. Though the 300 is the most basic trim, the 300 Limited is equipped with many modern comfort and convenience features. The 300 Limited comes standard with leather seating and heated front seats that are can be adjusted with eight-way power controls. To help keep front and back seat passengers comfortable during long car rides, the car is equipped with dual-zone automatic climate control and the air conditioning system has a great air filtering system that helps prevent exterior smells from being too noticeable. When extra space is needed for large items, the rear seat is a 60/40 folding seat that allows access through the trunk. The Chrysler 300 Limited also comes with a variety of safety and security features that make the driving experience safer and easier. The Limited comes standard with anti-lock disk brakes on all four wheels, as well as traction and stability control. There are airbags located throughout the car including a driver’s knee airbag, side curtain airbags, and there is an automatic crash notification via the Uconnect system that keeps drivers and passengers connected in the event of a mishap. There is also a tire pressure monitoring system and remote proximity keyless entry, which allows drivers to unlock the vehicle by touching the door handles or the trunk button as long as the key fob is in close proximity. And once inside with the key fob, you can start or stop the engine by press of a button. The 2016 Chrysler 300 Limited has a starting price of $32,160. All Chrysler vehicles are backed by a 3-year or 36,000-mile limited warranty, a 60,000-mile or 5-year powertrain warranty, and 5 years or 100,000 miles of roadside assistance.